I am an American like many other Americans, born into a family of mixed European and Native American ancestry. My interest in my own origins started early. I knew that my European ancestors were pagans who were converted to Abrahamic faiths, and that my Native ancestors were pagans mostly obliterated by those Europeans. I knew all of this in my childhood, and it led me to question the Christianity taught to me by my grandmother (a saintly woman who taught me to pray and seek the divine). I read books, lots of books, on ancient Greek, Roman and Celtic religious traditions. I traced their roots eastward, into India, and began to read the Upanishads. 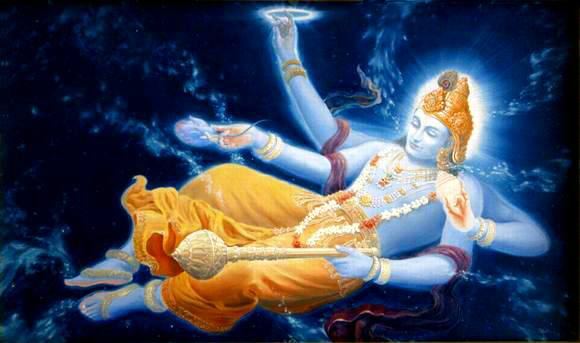 Within Śrīla A.C. Bhaktivedanta Swami Prabhupāda’s translation of Śrī Īśopaniṣad I saw a picture of Mahā-Viṣṇu reclining on the Causal Ocean emanating universes from his pores, and for me it was the moment when all the Western science I studied came together with all the complex imagery I had seen. The idea of a unified source and substance emanating all the manifold possibilities of material creation seemed a profound match for multiverse theory. As I examined further I learned that Hinduism describes a unified reality, not the duality of creator and creation that I had been taught in Sunday school – and that this matched with the quantum physics I was reading about. All of the onerous Monotheistic dogma I had consumed by growing up in the United States was lifted from my shoulders, and instead of simply knowing that I didn’t believe in Christianity, I realized that I had always intuitively inclined toward Hinduism. I now believe that we are all constituents of one ultimate consciousness as predicted by unified field theory, indestructible as predicted by the theory of the conservation of energy. I now believe in cyclic time – that universes are born and die repeatedly, rather than that creation is a one-off event moving along a linear timeline toward an ultimate judgment and everlasting reward or punishment. I now believe that we are not separate from nature, but are a part of it – interacting with it on the level of consciousness – that it responds to our awareness and expectations as demonstrated by the collapse of light waves into particles when an observer is present. I no longer believe that mankind is born in utter depravity under the burden of original sin, but rather that we are part and parcel of the divine, sparks of the roaring fire of the Godhead, imbued with the same being, consciousness and bliss that emanated us. The Sanatana Dharma – the eternal, intrinsic nature of ultimate reality, has filled the cavities within me that were never addressed by a regimen of exclusive Truth and fear of Hell, and it has allowed me to accept the variety and harshness of the World by setting it within a wider perspective – that our lives are but a handful of dreams in a limitless sea of possibilities.